Lasers have transformed our everyday lives, especially in healthcare. These intense beams of light of a single wavelength have revolutionized all manner of diagnostics and treatments, from general surgery to cosmetic therapy. 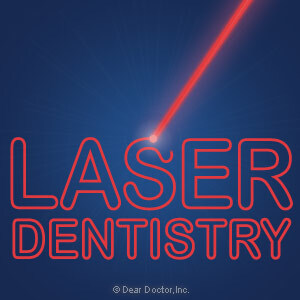 Dentistry has also been influenced by the laser revolution. Here are just a few of the areas where they’re growing in use and popularity. Early disease detection. Laser instruments can take advantage of “fluorescence,” the tendency of bacteria to “glow” when exposed to certain wavelengths of light. This is proving more effective in detecting early tooth decay in pits and fissures (very tiny areas in a tooth’s biting surface) than traditional needle-like probing instruments called dental explorers. Newer lasers can now detect the same fluorescent qualities in soft tissues, which may reduce the detection time for oral cancer and make the difference between life and death. Dental caries treatment. Lasers have become an alternative to the dental drill in treating teeth with dental caries (decay). Although with larger cavities lasers are somewhat slower than the conventional drill, they truly shine when it comes to early enamel caries and small cavities because they can be quite precise in the amount of tooth structure they remove. This feature allows them to be less invasive than a dental drill. Periodontal treatment. Periodontal (gum) disease is an infection caused mainly by bacterial plaque and calculus (hardened plaque deposits) that have adhered to tooth surfaces. Lasers are emerging as an alternative to conventional periodontal (gum) surgery to treat voids or spaces below the gum line called periodontal pockets that have formed because of gum tissue detachment as supporting bone is lost. With their ability to target and destroy infected tissue without damaging nearby healthy tissue, lasers can achieve similar outcomes as traditional techniques but with less tissue damage and discomfort to patients afterward. Research and development into laser technology continues to perfect these and other applications that promise to make dental procedures less invasive and more comfortable for patients. If you would like more information on the use of lasers in dentistry, please contact us or schedule an appointment for a consultation.